Whilst most drivers dread the worst kind of weather, Defender owners can look forward to those icy days because that’s exactly when these vehicles come into their own. Arkonik Defenders come Winter ready; kitted out with your choice of tyre, including award-winning BFGoodrich All-Terrain KO2s, specifically designed to deliver strength and traction in adverse weather conditions. They can also include modern comforts such as heated seats, plus practical accessories from shovels to roof racks; perfect for bringing home the biggest Christmas tree you can find! A Defender’s elevated height provides that extra ground clearance, ideal for ploughing through deep snow. Engaging low range will spread engine braking and torque more evenly across all four wheels, maintaining grip and control. 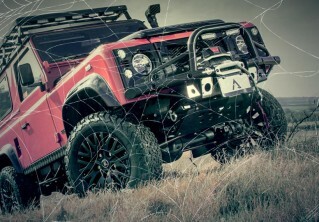 Plus, the front differential guard will offer protection against even the most aggressive obstacles. 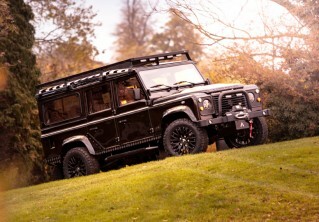 When the going gets tough, the tough get a Defender. Our client later swapped out his KAHN 1983s for beadlock wheels, as featured above.